Ahhh, it seems I have slacked on my blogger duties. The last time I posted a blog was June 17th (besides the one below about our upcoming Fall 2011 CSA), nearly TWO months ago!!! Oh my. I can come up with a long list of excuses for why this is the case, but I’ll spare you those. Instead, I’m going to post a few of the old “On the Farm” articles I wrote for our Ben’s Produce weekly newsletter. Enjoy! In the last week a lot has happened here on the farm. Two new apprentices have joined the Ben’s Produce team. Their names are Meredith and Aaron. Meredith just moved here from Colorado and she’ll likely be heading to Nicaragua to work on a nonprofit agro-ecology project in the Fall. Until then, we’re very excited to have her on the team. Two of our CSA members (Bradford and Melody – Melody is Meredith’s mom) pointed Meredith our way and we are already so very thankful to have her help out here. We only hope we can give her as much as she is giving to us. Aaron, like Meredith, also found us by way of a CSA member, Adam. Aaron is going to school this summer, but will be joining us on the farm on his days off and before class when time allows. Both Aaron and Meredith’s extra help is already going a long way! We also had the help of Alan Oswald, partner to Rene Oswald, author of Transitioning to Living Cuisine. Rene is doing a book tour up the East Coast from Florida on up to Montreal. Alan contacted Ben about a month ago to see if we would show him around the farm and to see if he could help for a day or two while they stopped in the Raleigh area. He just happened to find us online. Sure enough, Alan spent the day with Ben (I was diligently grading) doing all sorts of stuff. Ben said Alan kept up with him through the whole morning and afternoon. Alan is in his early 50s and he and Rene eat only raw foods. It seems the raw food diet provides quite a lot of energy, for Alan and Rene at least! So, these are the folks that have helped us on the farm this week. And to get an idea of what’s been going on in terms of the farm itself, I thought I’d share with you all some of the things we’ve marked off of the do-to list this week. 1) Ben spent quite a lot of time prepping ground (about a ¼ of an acre) with the walk behind tractor (aka tiller) and then seeded cover crops including, millet, sorghum sudan-grass, and cow peas. The two former grasses scavenge nutrients. This means they take up nutrients in the soil and recycle them. The cow peas fix nitrogen in the soil. 2) Ben, Alan, Aaron, Meredith and I all mulched almost 3,000 feet of peppers with straw. This basically means you place straw in the pepper beds. You do this for a variety of reasons including to suppress weeds, to hold in moisture, and to reduce soil splash (which keeps the dirt of f the pepper plants so they’re pretty but this also helps with disease prevention). We used about 50 bales of straw. 3) We also cultivated (fancy word for weeded) melons, winter squash and eggplant. 4) Ben inter-seeded buckwheat with the okra, field peas, and summer squash. We do this to suppress weeds, attract beneficial insects, add organic matter and prevent erosion. 5) Ben has been diligently staking peppers. We’ll be tying them shortly (to keep the plants from falling and/or breaking from the weight of the peppers). 6) Ben has also been doing quite a lot of tractor research. We were going to take a road trip to Charlotte last Sunday but after speaking with other farmers at market, we found out the tractor was way too pricey for what it is. So, we opted to float the Falls of Neuse with a few friends instead (and were able to do so thanks to Randy and Leza, who lent us their canoe for over a month!). 7) And finally, we harvest squash and cucumbers everyday and harvest everything else for the CSA and market every Tuesday, Wednesday and Friday. Saturdays Leslie (and now Laura and Brian as well) pick up our goods for the Clayton Market and Ben and I have been taking two pick up trucks worth of stuff to the Western Wake Farmer’s Market. Also, in all of that, I cook at least two meals per day, teach for my online Intro to Sociology course, write the newsletters, come up with recipes and type recipe cards for the market, do basic household chores including washing the never ending sink of dishes and laundry (including hanging it to dry and taking it down and in to put up), and every once in a while, also make samples for the Western Wake Farmer’s Market. This Saturday we brought quick cucumber kimchi and beef and cabbage bulgogi for beef day at market. Oh, and I forgot to mention we also had dinner guests on Wednesday night (CSA members Lara and Sam) and went to our neighbor’s 50th birthday party Saturday after market. It’s been a busy week and we’re ready for more. My folks and my nephew are coming into town tomorrow. That means I have to finish grading final essays and cleaning the house by tomorrow at 7pm. Plus, it’ s my nephew Julian’s 13th birthday on Thursday, so I need to get some balloons and cake action on somewhere between today and tomorrow. Meanwhile, Ben is going to check out a tractor in Zebulon tonight after the CSA drop. Keep your fingers crossed for us. We need to find a quality, affordable tractor. Ben is busting his hump on that walk behind tractor and it’s taking him at least three times as long to do things he’ll be able to do once we get that tractor. And while you’re at it, please send some rain energy our way too! I think y’all helped us out yesterday – we got ½ an inch! Okay – we hope y’all are keeping up with your own do-to lists and keeping happy. We’ll see you around. Well, another week has passed us by. And, as usual, a lot has happened in those seven days. My folks came into town last Wednesday, with my nephew Julian in tow. 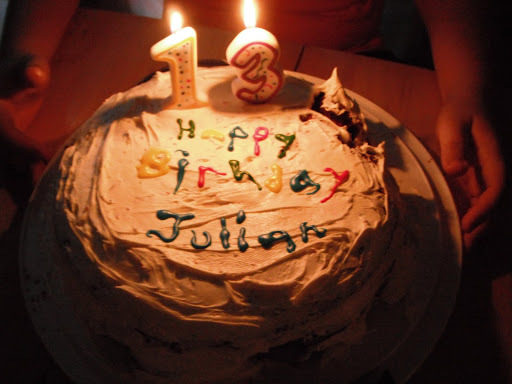 Thursday was Julian’s 13th birthday and he got to spend it weeding in the morning (we’re cruel, we know) and then we went shopping and baked a yummy red velvet cake (from Nancy McDermott’s book, Southern Cakes). · Dad and Ben built our chicken tractor!!! We’ve been wanting to build the chicken tractor pretty much since we got the chick-a-dees last year, but time and money kept us from doing so. As many of you know, the poor chickens have been cooped up most of their lives to keep Charlie the sweet, but chicken-eating, farm dog away from them. We do let them out in the evenings and keep Charlie inside, but we’ve really wanted to let them roam more often. We feed them greens daily, but at this point, we’ve been having to bring the greens to them. Now, we’ll be bringing them to the greens. For those of you unfamiliar with what exactly a chicken tractor is, well, it’s basically a moveable chicken coop. We’ll be putting the chickens out to pasture and they’ll be able to eat bugs, eat greens, and fertilize our soil while they’re at it (we’ll move them daily). Now we just need to work on getting some electrical fencing so we can keep Charlie and other chicken “loving” critters away from them. · Of course, we also did a whole lotta weeding this week. This is Julian’s least favorite farm task. I happen to think it’s not so bad, especially with our sandy soil. We weeded the butter beans, the field peas and the okra. We also all received bee stings of some kind. Well, almost all of us (Meredith managed to escape the wrath of the bees – but Ben, Aaron, my dad, Julian and I all received stings on Friday). · Yesterday Julian, Ben, Meredith and I all took strawberry cuttings off of the spring strawberry plants. We cut plants between 2 ½ and 4 inches long (about 700 of them) and them Ben made soil blocks and Meredith and I potted up the plants. We’re hoping we’ll be able to grow some strawberries for the fall – keep your fingers crossed for our fall fruiting experiment (it means you’ll have berries too!). · We also finished up staking and tying the peppers. There are plenty of peppers on many of the plants, but none of them are quite ripe – but you should start seeing peppers in your shares soon. · Monday: Julian and I went to Kure beach. We packed a picnic and swam, dodging jelly fish as best we could, boogie boarded, built a sand castle with moat, and collected sea shells. We also stopped at a seafood place on our way back home to bring home some NC shrimp and scallions – YUM! 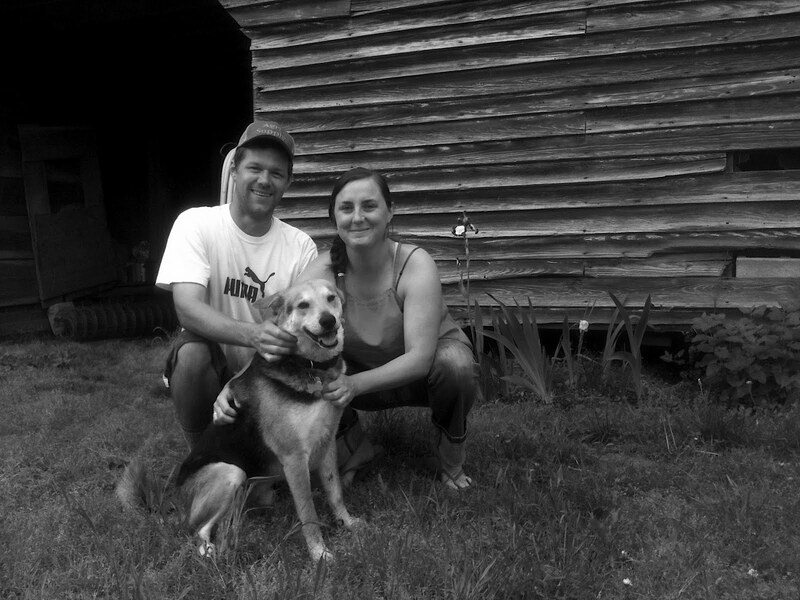 · Tuesday: Ben, Julian and I harvested for the Tuesday CSA folks and Farm it Forward. Julian and I set up the drop and then packed up to head to the last Cooking Matters class for Farm it Forward. Julian had an awesome time and the Inter-Faith Food shuttle gave him a Cooking Matters cook book and nutritional information packets for his enthusiasm. After the class, Julian and I headed to CSA members and friends, Cate, Jeff, Ally, and Josh’s place for Josh’s 5th birthday celebration. Josh loves fireworks, so our lateness was sort of perfect timing – just in time for the fireworks and cake. · Thursday: We all harvested and then we met up with CSA members and friends, Emily and David, to check out the Carolina Mudcats game. It was Julian’s first baseball game (that he could remember). He bought a foam finger and David brought Julian a glove. It was quite cute seeing him with one on each hand ready for a foul ball (glove) or a homerun (foam finger). Hot dogs and peanuts were had. 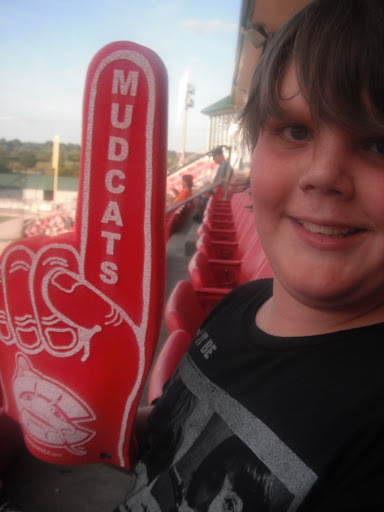 Julian even got Muddy the Mudcat (the team mascot – who is a catfish, if you don’t know) to sign his foam finger. 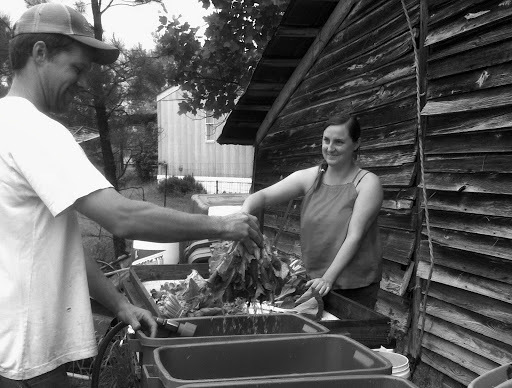 · Friday: We all harvested for the Western Wake Farmer’s Market and the Clayton Market. We finished up early so we could make it to the 4:40 pm last Harry Potter movie. Julian even had time to fashion himself a wand to take with him. I’ll confess – I went to the grocery store prior and bought soda and snacks to sneak in to the theater. I carry a large purse and that can be particularly handy when going to see over-priced movies and smelling all of that over-priced popcorn. I think Julian was a little embarrassed when our soda cans popped loudly, but when I suggested he buy us some snacks from the concession stand, he got over it J. · Saturday: We all headed to market. When we got home, we made lunch, ate and packed Julian’s things up. His flight was scheduled for 6:35pm. This was Julian’s first flight and his first flight alone. I spoke with my mom (his Oma) after he arrived and she said he was ecstatic about the flight. After we saw Julian off, Ben and I went to the Bavarian Brathaus for dinner. I bought a Groupon last year for Ben’s birthday and Saturday was the last day it was usable. · Sunday was fun day. Ben and I slept in and picked some of Beth’s blueberries and Ben made blueberry muffins. I’m not sure how many he made, but we’ve already eaten them all! We spent Sunday relaxing. · We cleaned about 300 pounds of onions. When they’re curing, we keep the green tops on. Once they’re finished curing, we have to cut off the tops, one by one, for storage. Since this is something you can do sitting down and in the shade, this was one of Julian’s favorite farm tasks. · We cultivated, staked and tied the second round of tomatoes – or rather, Ben and Kevin did these things. · Ben, Meredith and I put up our newest edition – the high tunnel. We put shade cloth on it so we can keep the seedlings in it (and keep them away from the rain, so we can control the water, and the bugs). This first tunnel is about half the size of the other 2 or 3 we would like to construct this year. It’s 54×12 feet and it cost us about $450 to purchase the materials (which is about $0.72/square foot). · We also purchased and received a truck load of compost (38 yards) for the fall crops. Ben’s Produce offers vegetables, strawberries & flowers of the highest quality and taste in the Triangle. Our mission is to strive for healthier people, community, agriculture and planet by growing and sharing the best tasting food we can. Our farming practices may surpass organic guidelines but we choose not to be certified because we are confident the quality and taste of our produce, as well as our direct relationship with you, speak to our commitment to healthy food and holistic agriculture. 2011 will be our second year farming as Ben’s Produce, though we have been farming with family and friends for many years. CSA is a mutually beneficial relationship between us. By making a seasonal investment in our farm with a CSA share, you become a seasonal farm member who shares the rewards and risks of the harvest season with us, your farmers. Your investment allows us to afford annual start-up costs, to pay ourselves fair wages, and to share the many risks in growing food. In return, we provide you and your family with abundant, fresh, healthy and local food. Our food not only tastes better and lasts longer, it’s also helps us all nourish local agriculture, economy and environment. Taste the difference! Is CSA right for your family? It is good to be aware of the rewards and challenges involved in CSA. If you and your family want to explore the wonderful tastes of our farm-fresh food by eating it straight from your CSA pickup bag or transformed in a delightful dish you cooked, CSA is for you! If you want to expand your taste-bud horizons and strengthen your skills at cooking and preparing fresh food, CSA is for you! If you want to be surprised with new vegetables, CSA is for you! If you want to eat healthily and enjoy eating, CSA is for you! Please understand that nature’s abundance varies. What you receive is based on our harvest schedule which is subject to the weather, pests, disease and a large myriad of influences. Some weeks your CSA share may be less than the retail farmers market value we try to maintain. However, we usually provide more bounty than you could buy at market value. If you find yourself with too many items, do not despair, share the bounty with others! . About two grocery bags of at least 7-10 seasonal organic vegetables and herbs (more for large shares). A weekly newsletter with produce information, cooking and storage tips, recipes and segments about life on and off the farm. Exclusive access to an online recipe-sharing site. Convenient pick up locations and times throughout the week. Adds ons including, bread, cheese, coffee, tea, pork, chicken, lamb and beef. Access to our farm for volunteering, exploring and relaxing. Invitations to on-farm events, such as our second annual OktoberFEAST. New friends who share your interest in good food and good farming. Join Ben’s Produce CSA by purchasing a CSA share at the beginning of the season. You then visit the pickup site of your choosing to pack your own vegetables from the harvest table. We will post a guide at the stand explaining what each share contains that week. 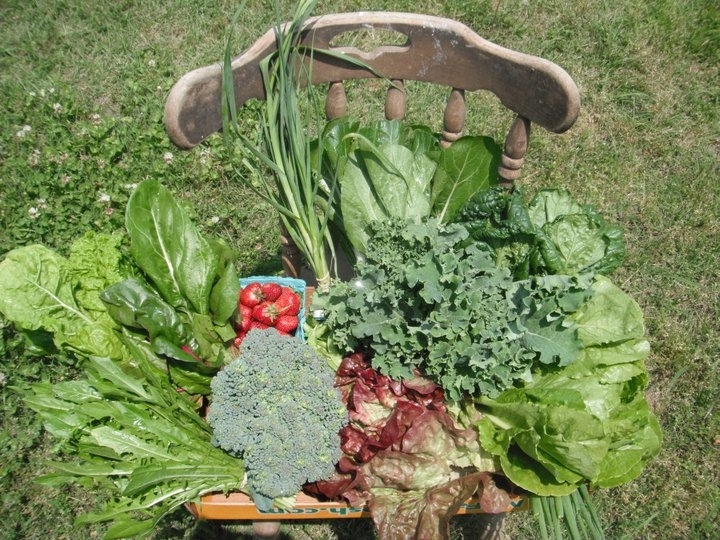 The Fall 2011 CSA harvest season runs for 10 weeks from early October through December. Raleigh Five Points CSA – Tuesday evenings from 4:30pm to 6:30pm, 1911 Bernard St., Raleigh 27608. Please consider signing up with the Raleigh Five Points CSA Yahoo Group through the link above, to access information regarding the pickup site and opportunities to support the other farmers who attend as well as local food events and information. Western Wake Farmers Market, Saturday morning from 8am to 12pm at the1225 Morrisville Carpenter Rd, Cary 27519. Sharing with others: If you choose to split a share with family or friends, please let us know on your registration so we may avoid confusion. Flexibility: We know you may miss pickup for many reasons. We prefer 24 hours notice, if possible. You may send friends or family in your place to pickup if you wish. Missed pickup is forfeit of that weeks share but we will try to make other accommodations if possible. Communication: Our main mode of communication is email. We will send all members weekly emails usually a day or two before pickup. Our emails are meant as pickup reminders and usually include farm updates, a list of that weeks veggies, a link to our latest blog entry and any notifications regarding pickup. Our blog functions as our farm newsletter that includes farm news, anecdotes, reflections, recipes, photographs and more. We offer our collaborative CSA service to bring you the best food from farmers and producers who attend Western Wake Farmer’s Market with us. We will send you an email detailing this service after you sign up for our Fall CSA. We strongly urge patronizing these folks if you pick up at market instead of using this service. Our Small Share is the same size as the Regular Share but is distributed every 2 weeks instead of every week. Our Regular Share is a suitable amount of produce for a small household of 1 to 3 people, or one well eating vegetarian to eat for one week. Our Large Share is a suitable amount of produce for a large household of 4+ people, or a couple of well-eating vegetarians to eat for one week. Our CSA is first come, first serve. You must send payment to secure a share. We prefer you send us Full Payment but our Payment Plan of a deposit and consecutive payments are accepted for your flexibility.We will use your CSA share payments to purchase much needed materials for building three high tunnels. These high tunnels cost about $800 a piece and we will construct them ourselves. They will serve as unheated greenhouses and will allow us to provide you with nutritious, wholesome food throughout the year. It will also allow us to provide you with early spring and summer crops. Please consider paying for your CSA share in full as soon as possible, if this is feasible for you. We thank you for your support! Full Payment – Enclose a check for the total due. Payment Plan – Enclose a deposit to secure your share. Please send the amounts listed below 30 days and 60 days after the date of your deposit. You can find our Fall 2011 CSA brochure here. Please use the brochure to sign up with us. Please enclose a copy with your information and payment. We hope you will afford us the honor of being your farmers in 2011 and we are looking forward to a great year. We wouldn’t be able to be farmers without you and your support! Farm, market, museums. Home again, home again. Jiggety jig. Elliott and sunshine are here!